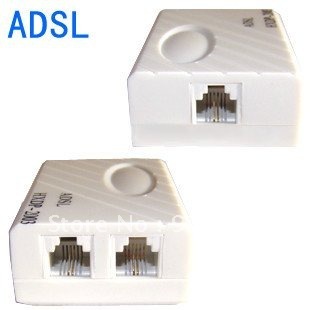 The ADSL Splitter separates voice signal and ADSL digital signal from telephone signal. One RJ 11 at one end for line, two RJ 11 at the other end for phone and modem. Separates voice signal and ADSL digital signal from telephone signal. Protect the voice signal and ADSL digital signal from the interference of a fax machine and a telephone. The items you ordered will be shipped out in1-3 business daybyHong Kong Air Mailwhen your payment is clear. The arrival time is 5-20 business days to United States usually. We provide afree tracking numberfor the order whichorder price > $30, or there is no tracking number. We ensure dispatch the item within 1-3 business days. However, you bought the item from opposite side of the earth, so it needs a little longer time to deliver. Please place order only if you agree with the shipping time and all the terms below. We did **not** provide the real product's real weight because of the limitation of Aliexpress for free shipping product, if you want to know the real weigth, just leave us a message. Automatic split dispatched as multiple parcels if your packages weight is more than 2kg. Please leave note for your special request (e.g. Colors or Size) when you pay the order. If the item is defect when you receive it or you are not satisfied with it, please return it within 14 days for a replacement or money back. But the items must be back in factory condition. Please contact us and double check the return address before you return it. If is item is defective in 12 months, you can return it to us. We will send you a new replacement after receiving the defective item. We greatly appreciate your POSITIVE feedback. Please do NOT leave negative or neutral feedback without any contact. If you havent received item in 30 days, please contact us and we will arrange refund. 16 ports Q2403 modem pool, Hot Sales & Fast Shipping! !